Two languages  German / English, 133 pages. Pelikan MC 120 deluxe This is a nice piston fill fountain pen with a 2mm calligraphy nib from circa 1980. 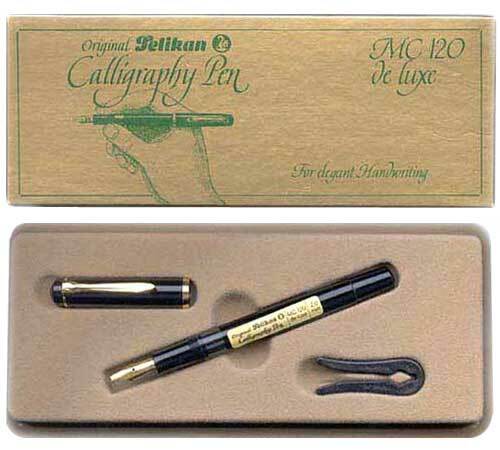 *The Pelikan M200B looks exactly like the MC120 but has an everyday writing nib. The vintage Pelikan 120 is a totally different pen. THE PELIKAN COMPANY was founded 1838 in Hanover, Germany. In 1929 Pelikan introduced the black-and-green-striped fountain pen. The Graphos Indian ink fountain pen and the Plaka paints were introduced in the 1930s. THE RUSSIAN ARTIST El Lissitzky (1890-1941) was one of the great avant-garde figures of the early twentieth century. He became seriously ill with tuberculosis in 1923 and went to Switzerland for treatment. During his convalescence, he supplemented his income by designing typographic and photographic advertisements for Pelikan. Kurt Schwitters, who was living in Hanover and working for Pelikan, probably introduced Lissitzky to the firm. Several of Lissitzky's advertising designs are displayed in the web exhibition "Monuments of the Future": Designs by El Lissitzky at the Getty Research Institute. Designed for all Pelikan and many other fountain and calligraphy pens. Pelikan's superior 4001 ink is water-soluble and non-clogging. Available in black, blue-black, red and royal blue from our US advertiser MisterArt.com. The standard ink cartridge for all Pelikan cartridge fountain pens and many other brands, Package of 6 cartridges. Order from MisterArt.com. Read about Pelikan fountain pens in The Pennant Vol. XV, No.2, Summer 2001 on the Pen Collectors of America (PCA) site. Souverän  High-quality writing instruments. Search eBay auctions for new and antique Pelikan Pens. The most exclusive and largest writing instruments of the Souverän range. Super-size plunger fountain pen. Large hand-crafted, finely engraved 18 carat gold nib with rhodium decoration. Gold-plated Pelikan clip. Solid brass components in the mechanism. »Pelikan SCRIBTOL Ink and PLAKA paint advertisements. »Pelikan Erasers  check out Charles and Susan's eraser paradise  15000 or more pieces!!! All images, characters, logos and trademarks are property of their respective owners and are used here either with permission or in an editorial fashion only. Content on this site is ©1999-2004 BLAM®. Hans Presto is a Swedish lettering-artist and art-teacher. BLAM design supplies new and vintage steel pen nibs (pen points) to Scandinavian cartoonists and calligraphers. This web site is not affiliated with the Pelikan company in any way. This is an independent site containing information about pens and calligraphy tools.